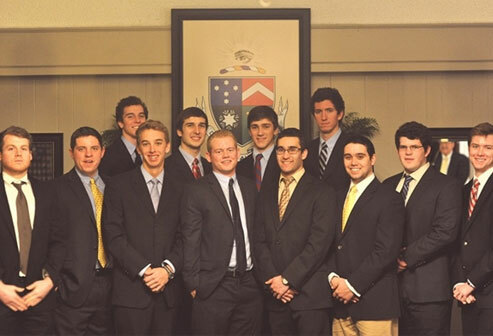 The Gamma Upsilon chapter of Delta Tau Delta prides itself on service in the Oxford community and around the country. In the spring of 2015, the Delts held a philanthropy event at a local restaurant and bar. The event was titled “Cups Against Cancer” and all proceeds benefited the Leukemia and Lymphoma Society. In total, Gamma Upsilon raised $1,500 to fight cancer! Our dedication to service and impacting others didn’t stop when final exams were finished. As members packed their bags to depart on their summer adventures, they extended their outreach even further. A current senior, Christian Curatolo, spent his summer in Aspen, Colorado working for an organization named Challenge Aspen. He provided people with disabilities and injured military personnel with recreational, educational and cultural opportunities. Christian led various camps and weekly activities. Some of the highlights included white water rafting, camping, hiking, fly fishing, performing a musical, going on cave tours, holding cooking lessons and learning about art history. In addition, Christian’s work with people with disabilities and injured military has been constant for the past five years. Every winter he teaches adaptive skiing in Buffalo, NY and Aspen. On campus, Christian also acts as a liaison between Delta Tau Delta - Gamma Upsilon and the Best Buddies program at Miami University. Through Best Buddies, brothers participate in monthly activities with people with disabilities on campus and in the surrounding Oxford community. Overall, the 2015-2016 school year is off to a great start. The chapter is holding a charity softball tournament, “Frats at Bat.” The proceeds from this event will all be going to the St. Jude's Children's Research Hospital. With so many great opportunities available through our chapter and Miami University, our brothers are in a prime position to make living a life of excellence a habit that will last a lifetime.